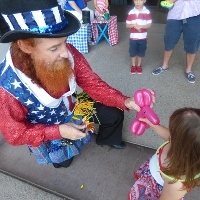 Enjoy one of our costumed balloon artists who have the artistic ability to create fun and exciting shapes of all kinds. Not only do these balloon twisters have technical skill, but also a warm and pleasing personality for your event. These entertainers are guaranteed to bring your party to life and smiles to the faces of your guests.